Dan's family is Italian. I have learned that this is very important, and that he will never let me forget the time he was downtown in Nashville looking for spaghetti and I suggested Demos' and he hated everything about it. (In fairness, I'd never eaten there, and it was the only spaghetti I could think of near Broadway that wasn't Sbarro.) I heard about Mangia Nashville from a work friend, and I knew it wasn't just an Italian meal, but an experience... so on a whim, I e-mailed to see if they had an opening on the weekend after our wedding. Reservations are required! They did, and we decided to make it a celebration of our first week of wedded bliss! We attended near the end of their summer menu, and they make seasonal updates throughout the year. We arrived on time, and we were seated family style at one of a few large tables set up at Cool Cafe, their current location. (Word on the street is that they're moving at some point, so keep up on their Facebook page!) We were seated with other guests, which was very fun... we even ended up sharing bottles of wine with our tablemates. I loved the antipasti! While I don't like olives (and made Dan eat some of my fried olives), I LOVE risotto and mozzarella. The housemade focaccia was delicious too. Everything is served family style, so you pass dishes around and take your portion. It reminded me of dinner at West Point in a really positive way, because we ate family style at meals too. I may have to try to make risotto cakes at home. The seasonal salad was really interesting, since it combined fruits and tomatoes. Definitely a summer dish! I'm not a salad person, so this was a nice alternative for me. My favorite dishes were definitely the pastas! Seriously, I can't even describe. I want to eat them all the time. The bolognese was delicious and the orrechiette was awesome. By the time we got to the entrata, I'd had a lot of wine and didn't even remember to take photos. But I remember the chicken was moist and delicious, and Dan loved the roasted veggies. Oh, and the other thing I forgot to mention... there's dancing. There's singing. I remember belting out "Summer Nights" from Grease at one point. And a women's conga line. 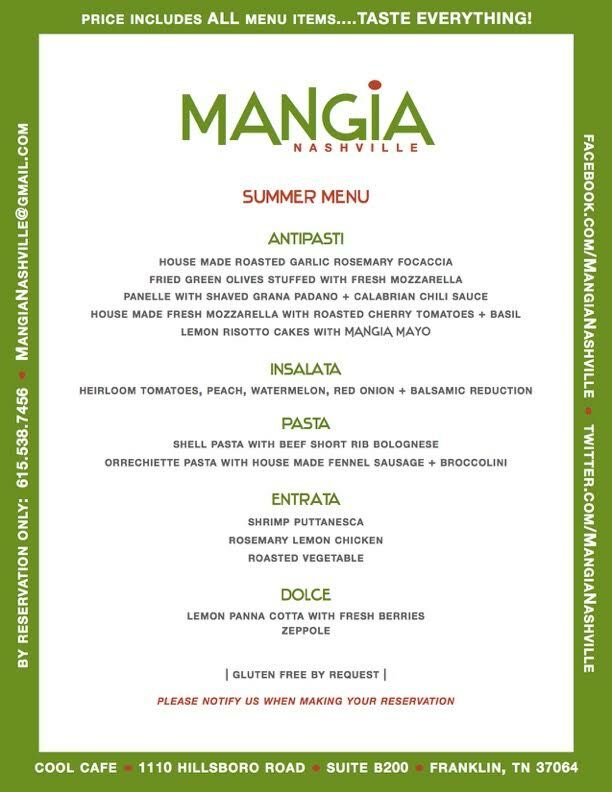 Nights at Mangia Nashville feel like attending a wedding reception with a bunch of strangers, but everyone ends up leaving as friends. It's an event, in every sense of the word! The creator of Mangia, Nick, has made Friday and Saturday nights a true celebration. The desserts were top notch. The panna cotta was incredible, and I ate it all. Everyone took delicious zeppole home, one of my favorite parts of the night. NO ONE is making ricotta doughnuts this good in Nashville, and Nick did it first! We paid about $170 for two, including a bottle of chianti and tax. When you think of all the courses (not all pictured here, because, well, wine) that is honestly one of the best deals in town. I recommend it for larger groups of friends and family who aren't shy, couples who want a celebratory date for a birthday or anniversary, or just for a splurge. There were event people who came by themselves, befriending others along the way. 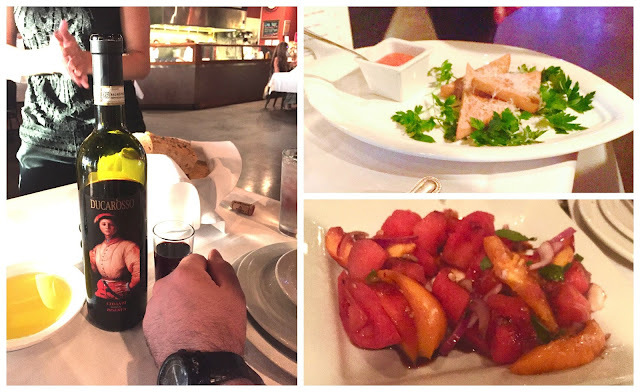 This experience definitely had Dan's seal of approval; in fact, he remarked that he'd love to bring his (Italian) best friend there, which is very indicative of what he thought of the meal!